This small area game is a great way to get players thinking PASS. It is a game that should be played 4 on 4 but can also be played 3 on 3 or 5 on 5. 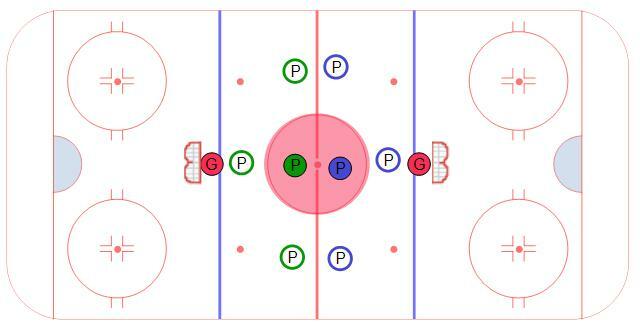 Each team designates one player that must stay within the center ice circle, the "Middle Man". In order for a team to score a goal, the team must use their "Middle Man" after a turnover at least once. The "Middle Man" may also score without passing the puck as long as they stay within the circle. This forces the both "Middle Men" to play defense and try to get open in a tight space. By having to make a pass to the "Middle Man" it places a great emphasis on passing.